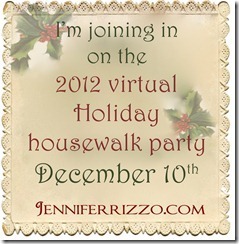 I’m completely thrilled to welcome you into my home today for the 2012 Virtual Holiday Housewalk from Jenn Rizzo. Did you enjoy yourself over at Stop #14, Kristin’s home? I’ll tell you a secret… My Uncommon Slice of Suburbia has my most favorite fireplace in all of Blogville. My apologies to all the other fireplaces out there. Because her big stacked rock beauty? I swoon every time I see it. It looks even better all swagged out for Christmas! Since this is my very first year as a virtual Housewalk Hostess please let me introduce myself. My name is Beth, and you might have seen my home before and just not realized it. This little photo that I took in 2010 gets around on Pinterest quite a bit. That is my son in front of our glowing Christmas tree a few years ago. Stick around and I’ll show you the 2012 version of this photo at the end of this tour. I’m going to admit something here—This year I decorated the front porch exactly like I did last year. 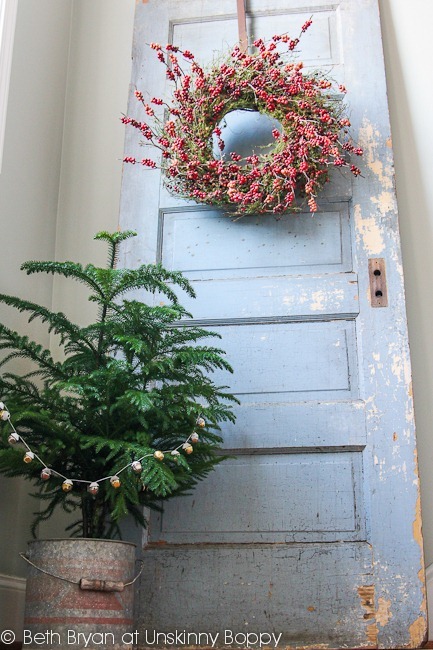 I even recycled the DIY evergreen wreath by adding more fresh stems. I have been so busy decorating the inside that I haven’t had time to get a good photo of the porch, so I’m also going to recycle the photo of the front porch that I took last Christmas! We actually tell all of our friends and family to come in through the back door anyway, so since we are all friends here y’all come around back! This décor is new for 2012. 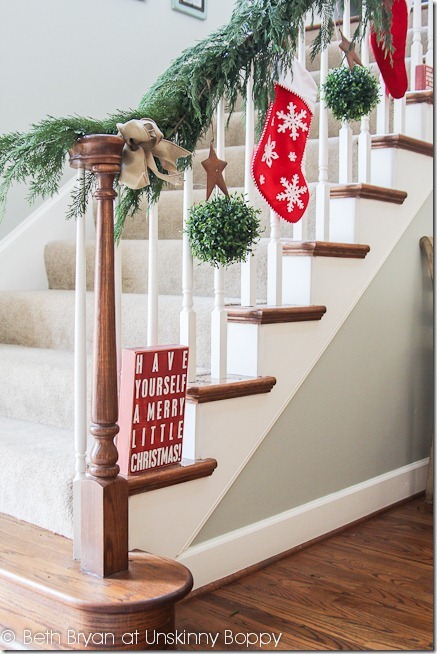 The staircase railing got a garland of evergreen. I’m a little bit of an evergreen fiend this year. Our stockings are hung on the stairwell with care. Dangling stockings from heavy metal objects high atop my mantel freaks me out, so this seems safer, although my four year old did ask how Santa was going to reach the one at the top of the stairs. I told him Santa can climb stairs. 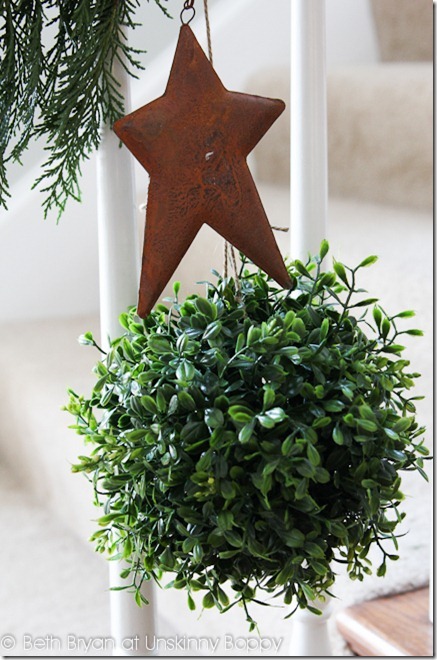 I bought these faux boxwood kissing balls at the same store in Pennsylvania Dutch Country where I spotted the galvanized bunting. They are so realistic looking that I don’t mind mixing in a little bit of faux greenery amid my fresh. 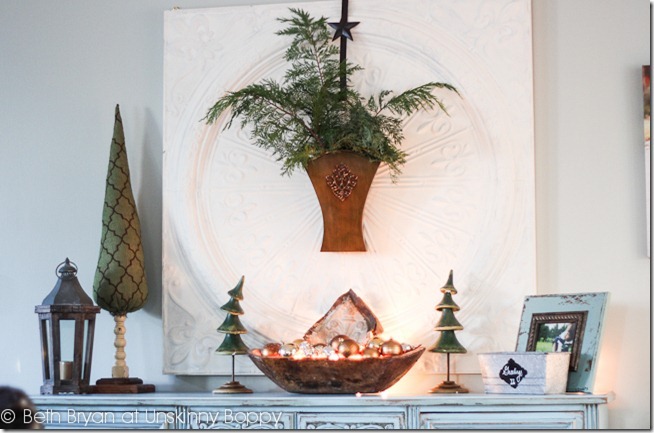 At the bend of the stairs sits a cute little tree in an old galvanized minnow bucket. Up North they have sap buckets. Down South we have minnow buckets! My mother had one of these trees when I was a little girl. We always called it a Ming tree, but Google now tells me that is not the name of it. Does anyone know what this tree is called? It’s great having a tall husband to help hang the high decorations! Thanks, babe! I have a bit of an obsession with gold leaf ornaments. I have been collecting them on vacations from all across the US for years. Every year when I hang them on my tree I am reminded of fun trips to Vermont or Vancouver. These matching glittery ones came from Walmart down the street, though. Oh, commercialism… Why must you be so tempting and easy? And glittery? The glowing dough bowl made a come back this year with a prominent spot on the credenza. 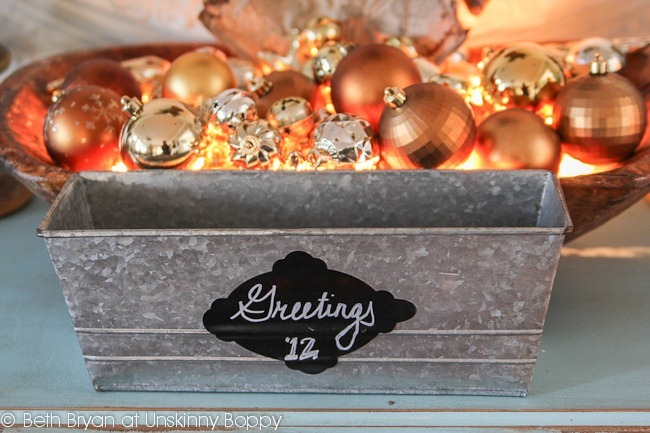 I created this chalkboard label for a galvanized bucket to hold all of our Christmas cards once they start rolling in. I love getting Christmas cards. You can see more details of my Joy to the World Mantel here. Moving into the kitchen now, are you surprised to see more greenery above the window? Evergreen fiend, I’m tellin’ ya… I found this curled wood pomander at Target. 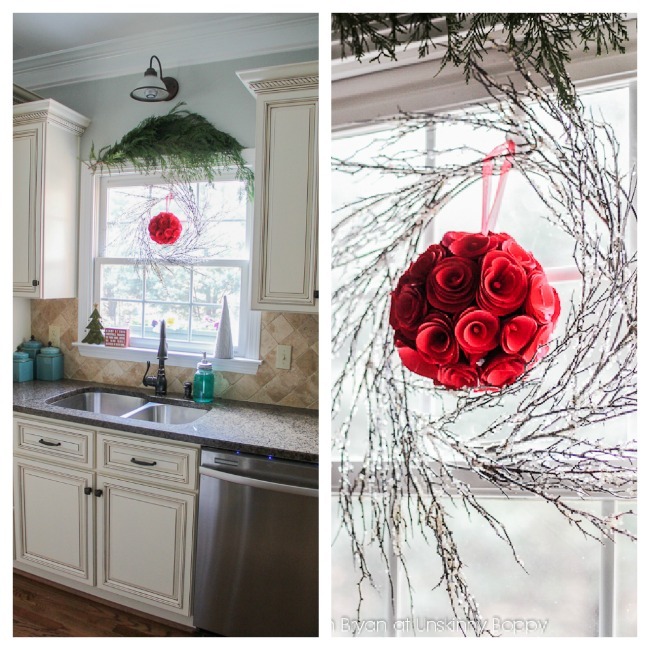 The icy branch wreaths have been in my decorating repertoire for many years. They are so simple and beautiful. This little sign makes me so happy. And a sweater tree on clearance? Yes, please. 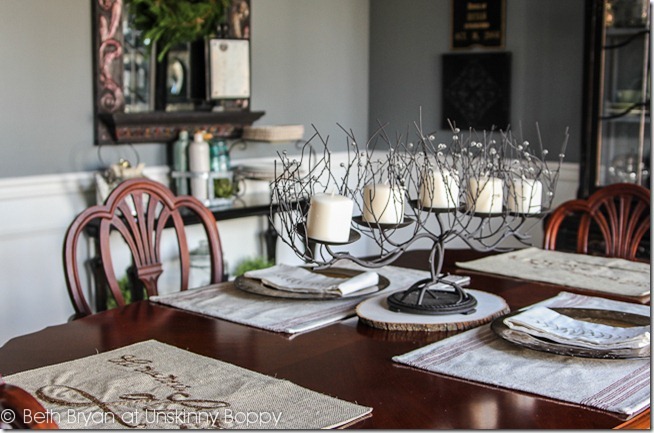 I easily transitioned my Thanksgiving kitchen table decorations to Christmas decor by adding cute metal “ornaments” that I found at the Pottery Barn outlet in New York during our October trip. The center piece stayed the same, but I added a cute polka dotted burlap fabric for a runner. Into the dining room now for the final room of the tour. I don’t have any Christmas parties planned, so I’m keeping it simple in here this year. 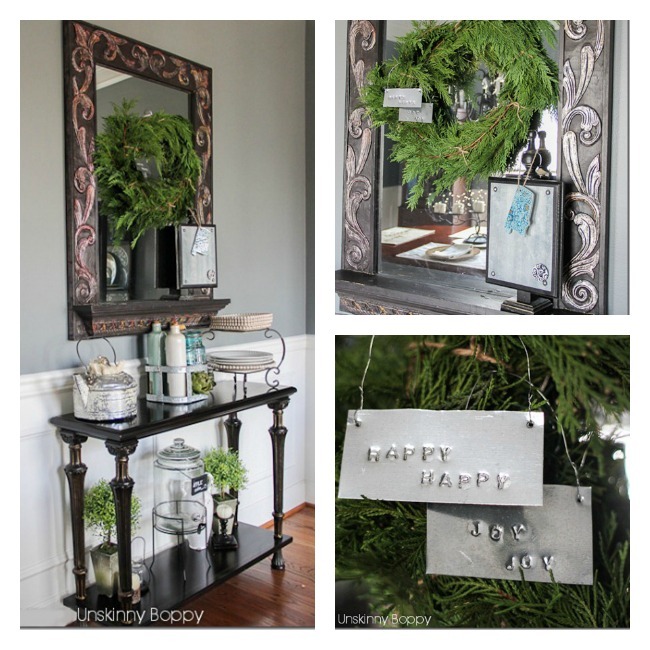 I hand stamped these cute “Happy Happy Joy Joy” ornaments for the wreath ion my sideboard. Santa brought me a metal stamping kit this year, so I opened that gift a little early and got to work on these. They look very cute on a wreath. Beware those sharp edges, though! That wraps up my 2012 Holiday Housewalk! I hope you guys enjoyed the tour. I’ll leave you with this year’s glowing tree photo. Can you believe how much my little man has grown in just two years? Four year olds can reach much higher on the tree than two year olds. He’s over the halfway point. If you would like instructions on how to shoot a photo similar to this one please visit my tutorial. Thank you all so much for stopping by to visit my home this year. I’m extremely honored to be a part of this virtual housewalk with all the other amazing bloggers who are featured. Thanks for having me, Jenn! Now, please continue on to the next stop on the tour. Tracy at French Larkspur was one of the instructors of the Creatively Made Home series, so her home is sure to be wonderful! 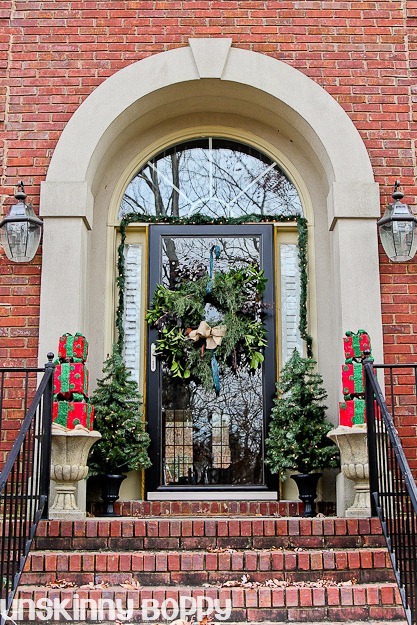 Head over now to continue the tour and see more beautiful Christmas decoration ideas! 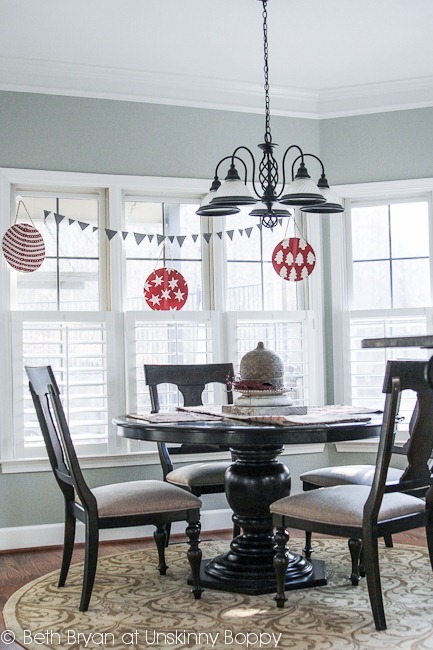 Get your pinning finger ready- her holiday home is GORGEOUS! Happy Holidays to you, too, Kris! I appreciate the new follow so much! Beth, your home is simply beautiful, Walmart ornaments or not!! Do send me your address so I can fill your bin up with a Christmas Card! 🙂 Hope you are enjoying the holiday season! how fun to meet you!! yes i know your pinterest rockstar status photo for sure! It’s nice meeting you too, Paige! Thanks so much for reaching out and commenting! Beth, your home is just gorgeous! 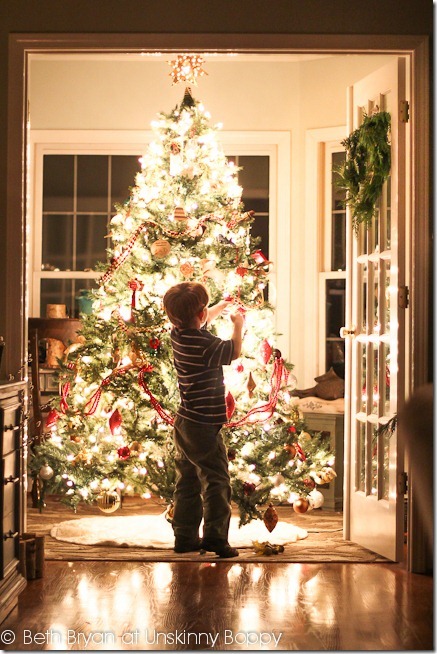 My favorite picture is the one with the tree all lit with your son in front of it – just spectacular! Thank you for sharing your home with us! Merry, merry! Thank you Karen! I plan on taking that same photo until he’s 30. maybe longer. You’ve spared no detail, and it shows! 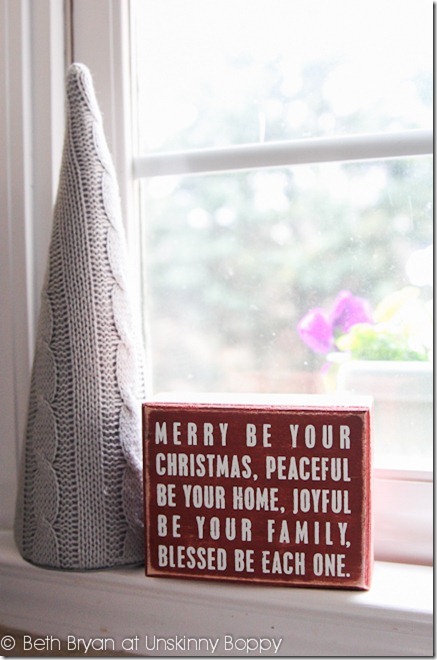 Merriest Christmas….looking forward to a post with you later this month! Tara, I cannot WAIT either! Thanks so much! Yes! 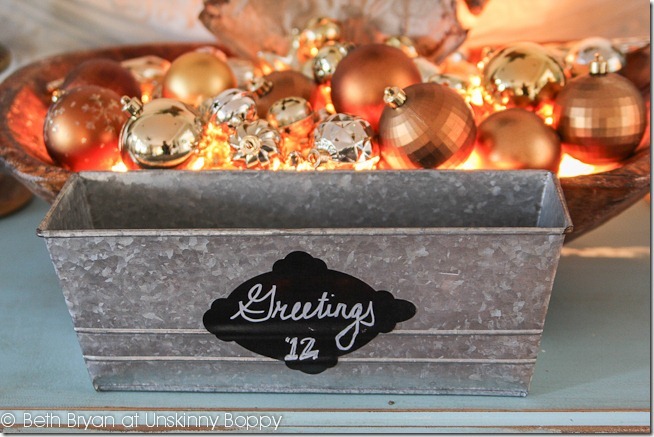 It’s such an easy way to breathe new life into an old wreath! Thanks for the follow! Your home is gorgeous Beth! Love the photo of your son in front of the tree! Thanks for sharing it all with us. Wow! Your home looks amazing Beth. I love the icy branches, the just right amount of pretties you have around, and the JOY above your mantel is beautiful. I just love your honesty too. Hey, doing your front porch exactly the same is just fine when it looks that good. 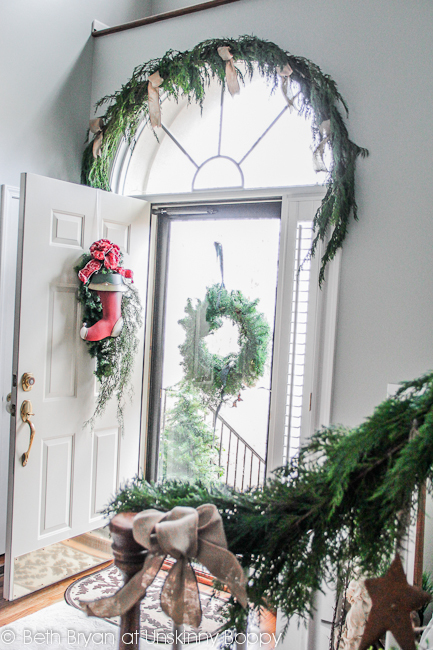 We moved this past summer and I can’t find my wreath … or a minnow bucket! LOL- I think I unpacked boxes for a solid year after we moved. I totally understand! My basement still has some long lost treasures buried down there. Thanks for your comment and compliments! Wow, that’s quite a compliment. Thanks so much Laura! That’s exactly the look I strive for every day! Thank you for all your kind words on my fireplace, I have had so much fun getting to know you. HA! That’s so funny, Kristin! Don’t be embarrassed, it’s a great big pinterest world out there! Your home looks so festive! I love all the greenery and your tree is stunning! Beth… your home is so lovely… thank you for sharing. The tree in question is a Norfolk Pine. All the special touches are so pretty. Love your holiday decor. Everything looks so beautiful! I love the door on the stairs. I’m so very. very excited for you! Congrats on the housewalk and they could NOT have picked a better home or blogger. You are wonderful Beth and your designs are superb! <3 u! Thanks to you my sweet friend! Love you! Beth it was such a treat to tour your beautiful home! 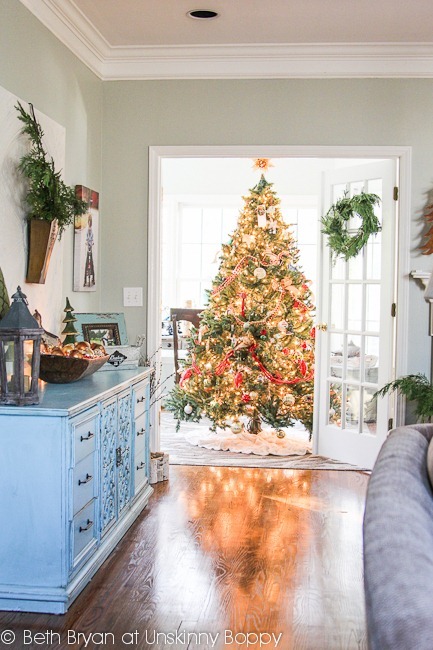 LOVE all of your Christmas decor and your tree is beautiful too! Your home looks gorgeous and that photo of the tree with your kiddo in front from a few years ago is amazing! Thanks for the warm welcome and happy holidays. Stunning, Beth! I love every little detail! My favorite is the updated tree picture! 🙂 Congrats on being part of the tour! Uh-Muh-ZANG! You rock my Winter Wonderland!!! I have a stack of fresh spruce justa waiting on me in the garage!!! Kicking up my heels and ready to get decorating! It’s on the agenda for this weekend… Yay!!! Absolutely stunning from that glowing tree to your metal stocking on the swag (it was like playing where’s Waldo – but in stocking form – once you told me you had the same one), to your glitzy Wal-Mart ornaments, to that glowing dough bowl and that ming tree (I had one last year and have no idea what it’s really called either)! What I am trying to say so un-eloquently is that your house rocks Santa’s stockings off! So glad to be part of this amazing house walk with you. Oooohhhh!! Glowing dough bowl!!! You got my attention there – so pretty!! 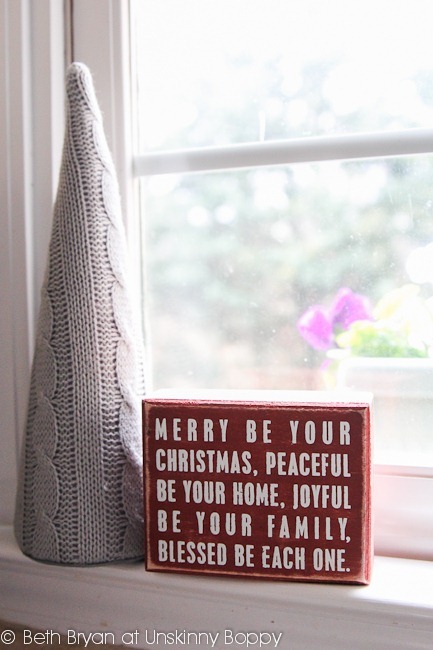 Your home is so beautifully decorated, cozy and festive! Congrats on being a part of this holiday house walk and thank you for opening your door to let us have a peek into your lovely home! 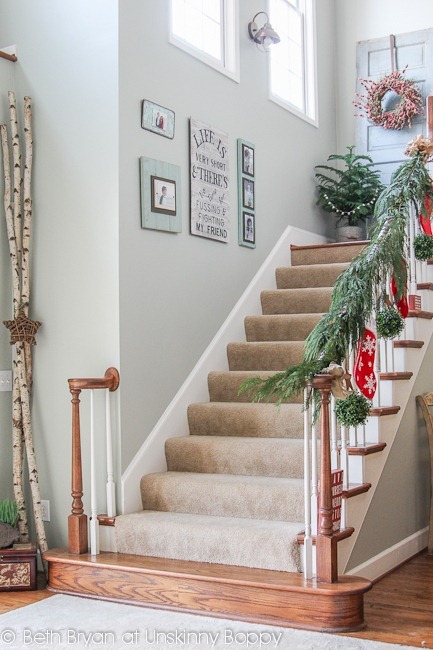 I’ve considered building a staircase to nowhere in my one level home just so that I can decorate the rail with evergreens. It’s so warm and inviting. I don’t know about you, but I’ve always admired them in just about every Christmas movie I’ve ever seen. Since I was a little girl, I dreamed of having an open rail staircase one day. Is that weird? Don’t answer that. It is so beautiful, Beth! I’m trying not to be jealous right now. So so pretty and I love your rock star home 🙂 Just simply beautiful! 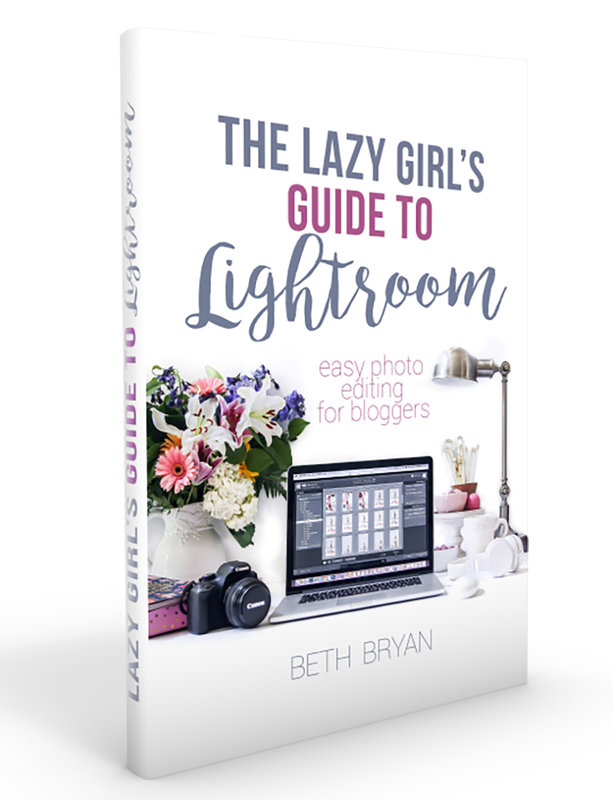 Amazing Beth, thanks for sharing! I loved this post! So warm and friendly. I love the invitation to come ’round back. Beth, your home is gorgeous and all of your Christmas decor is so cozy and warm. Thanks for sharing your home. This series is such a great idea and Jennifer did a great job of “casting” the line-up. I loved touring your home, Beth! It’s all so dreamy (you know I love all that evergreen goodness), but also totally real, and I love that. I’m so glad I got the chance to pop by today! That was so fun. It looks amazing. 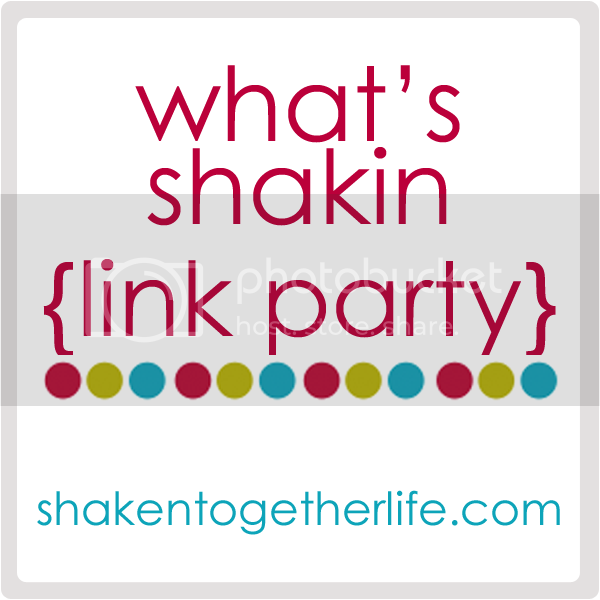 Beth, I am so glad you could join the the housewalk and share your fabulous home with us!!! Your home is gorgeous…from the first time you step up to the front door to the back….I loved seeing every beautiful detail….I did the very same thing last year with the topiaries on my banisters..and doing it again this year….Your mantel describes the essence of your home….JOY!!! Thanks for the tour Beth! Beautiful and inspiring…… all of it. Love, love, love your house tour, Beth! There are so many great ideas! That sweater tree is adorable (oh…..and those ornaments are wonderful, too)! Everything looks beautiful! And yes, I have seen that picture all over pinterest!!! Haha! Merry Christmas! I love all your Christmas decor! Your home is beautiful and I love the new photo of your son in front of the tree. It’s all so beautiful! I especially love the old blue door with the wreath on it! Your tree is magnificent! It’s gawgeous! I love all of your evergreen! 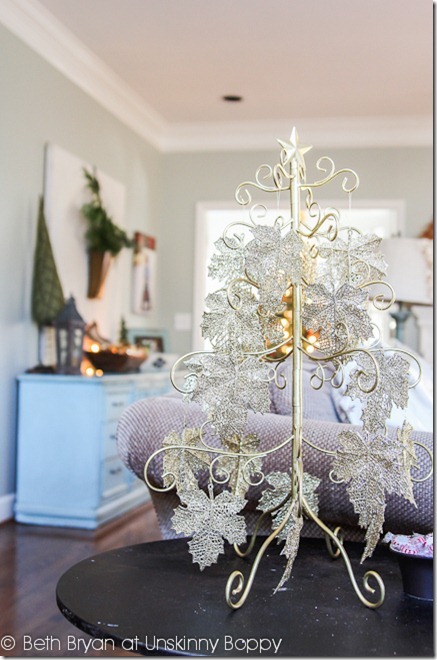 It looks beautiful against your light walls and all the beautiful light you have coming in your house! Beautiful! You are one talented lady! Your whole house is just beautiful. 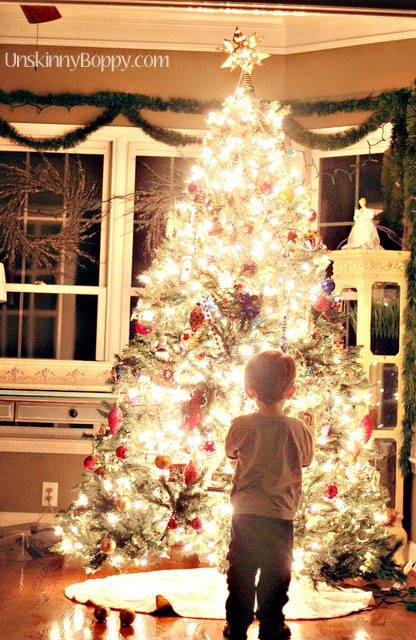 I love that you did two similar pictures of the Christmas tree with your son. You can really see how he grew at least a row of branches. It would be fun to see those two photos side by side. You have some mad holiday decorating skills. Love it! 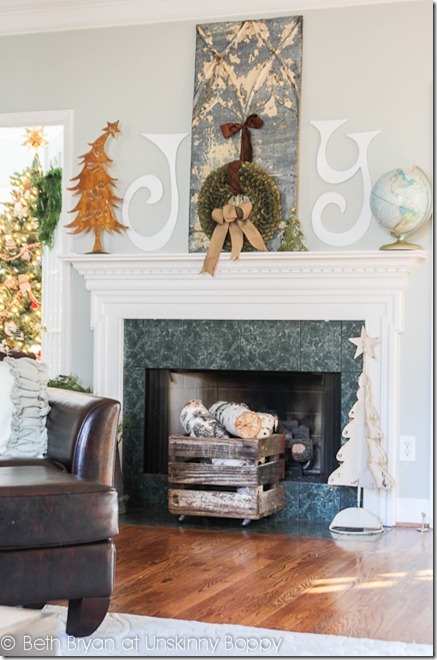 I love your Christmas decor…so pretty!!!!! I’m a new follower on FB and Pinterest. I see you live in Central Alabama,so do I. What part? Beth, what a stunning home you have! You’ve managed to strike the perfect balance between stylish perfection and homey coziness. Awesome work! I love the all the greenery (especially on the staircase! 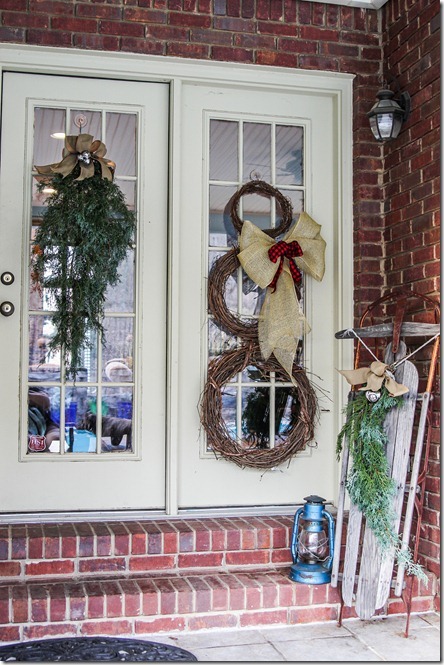 ), and the snowman wreath on your back door. You did a beautiful job decorating! Thanks for sharing at Dare to DIY! Um. Wow. I think that’s all I can say. Your home is just gorgeous. And it’s pretty all the time, but at Christmas? Magical. I love all the greenery on the stairway and the front door. And I’m totally digging the tree. And I just remembered that I wanted to make my own lighted bowl this year. I loved that when you posted it last year, too. Those stamped ornaments? Genius. And I think that I need to dig out my stamping set to make some, too. 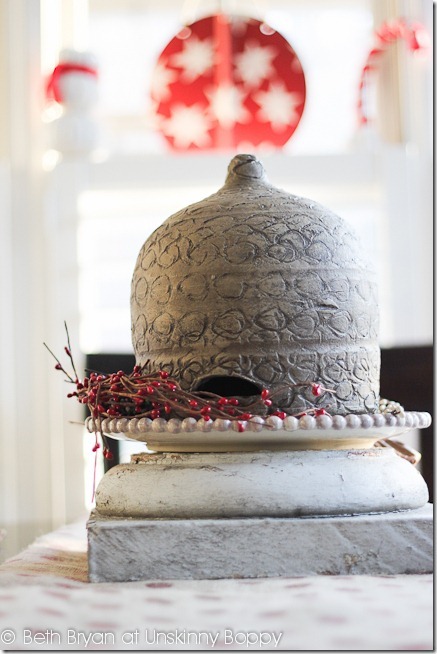 Thanks so much for linking up to Dare to DIY! I’m thrilled that you were able to join.